Like the other surfaces in your house, window blinds collect dust and dirt and need to be cleaned on a regular basis. When it comes to getting the blinds around your home clean, whether they are faux-wood blinds, fabric blinds, or aluminum blinds, they can be somewhat challenging. If you keep up on the cleaning, you can usually get away with a light cleaning using a damp cloth or sponge and some mild detergent. However, if it’s been a few years, you’ll need to take them down and wash them to keep them looking new. Learn how to clean blinds with these helpful tips and techniques. Cleaning blinds are one of those chores that most people tend to forget about. However, when you neglect your shades, they can become soiled with pet hair, dust, and other debris, like dead skin cells and dander. Knowing how to clean Venetian blinds properly, starts with identifying the material they are made of. One of the most favorite kinds of window treatments is wood blinds and faux-wood blinds. Not only do they look great, but they are relatively easy to clean and maintain. You can usually clean wood blinds without taking them down, and need a few items to get them clean and looking new. Start off by dusting your wood blinds using the brush attachment on your vacuum cleaner. All you need to do is close the shades all the way. Then, hold the bottom rail and vacuum one side. Next, turn the blinds the other way and vacuum the other side. Keep in mind, that you want the suction of the vacuum to be on the lightest setting, so you don’t twist or warp the slats. You can also use a handheld duster to dust the blinds if you want to save some time. If your wood blinds are in the kitchen, you may need to put in a little more time and effort to remove grease and grime that has collected on your shades, along with the dust. However, be careful not to use any aggressive window cleaner on your wooden blinds. Best is to make a window cleaner yourself using some simple home remedies. To clean your wooden window blinds in the kitchen, you’re going to have to give them a more thorough cleaning, with vinegar. Fill a small bowl with one cup of vinegar and one cup of warm water. 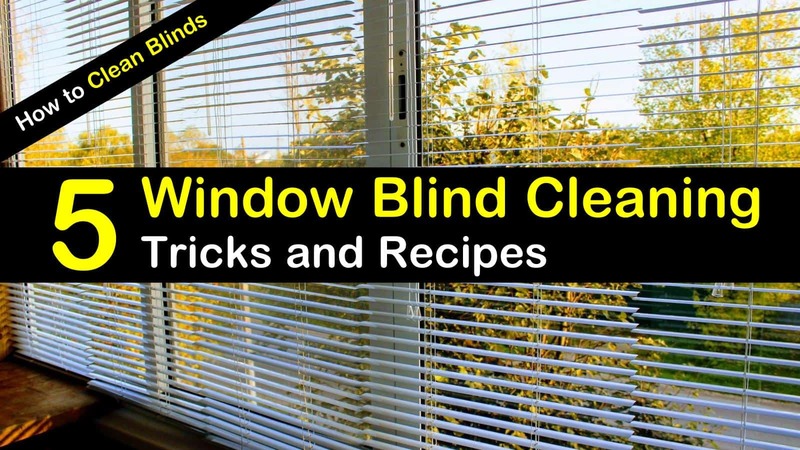 Using a microfiber cloth or sock, dipped in the white vinegar, wipe the blind slats down. Again, start by turning the blinds one way and wipe them down while holding the bottom rail. Then turn the slats of the blinds the other way and clean. The acidic nature of the white vinegar will cut through the grime and grease and leave your blinds looking new again. Your fabric shades are another window treatment that you can use your vacuum to clean. Whether you need to clean cellular shades, honeycomb shades, or are cleaning vertical blinds; your vacuum cleaner is your best friend. Like with the wood blinds, use the brush attachment on your vacuum cleaner to dust the individual vanes of the blind carefully. Be sure to keep the vacuum on a low setting to avoid damaging the fabric. Another great tool that you can use to dust your fabric shades, especially cellular shades, is your hairdryer. You can use a hairdryer, that is set on cold, to blow away the dirt that is trapped in the creases or inside the honeycomb opening. It also works great for removing bugs that are caught inside the honeycombs. If it’s been a while since you cleaned your fabric shades, you may have to contend with stains. Stains of fabric blinds are relatively easy to tackle, all you need is a sponge and a simple fabric cleaning solution. When dealing with stains and grime, be sure not to oversaturate the fabric to keep from damaging the blinds. In a small bowl, combine the dish soap and the water, and mix well. Dip a sponge into the cleaning solution, and squeeze out the excess liquid. With the damp sponge gently scrub the blinds. Avoid rubbing too hard because fabric blinds are delicate and can quickly become frayed. When cleaning Venetian blinds, use sideways strokes, starting at the top and working your way toward the bottom. When you clean vertical blinds, you want to use top-to-bottom strokes. When you’ve finished cleaning the blinds, use a damp, soft cloth to wipe the soap off the blinds. Let them air dry. If your fabric blinds are incredibly soiled, you may need to remove them from the windows and have them professionally cleaned. Aluminum and plastic blinds are incredibly durable and a practical addition for many houses. Cleaning aluminum blinds are essential if you want to keep them operating at their best. There are a few different ways for how to clean mini-blinds that are aluminum or vinyl. You can clean them like you would faux wood blinds, by first dusting them with the vacuum cleaner, to rid the slats of dirt and dust. Then, use an all-purpose cleaner to wipe each blind slat down. However, if you have a lot of aluminum mini-blinds in your home, or they are coated in grease and grime, you may want to take them down and clean them in the tub. Pour the castile soap, borax, and washing soda in the container. Add the warm water and the essential oils. Replace the lid and shake well to combine the ingredients. Use as needed. >> Extra Tips: For more on glass and window cleaning, check out our glass cleaner recipe. If your mini blinds are especially dirty, you might need to take them down and soak them one at a time into the warm soapy water. Fill your bathtub with warm water and add some liquid dish soap. 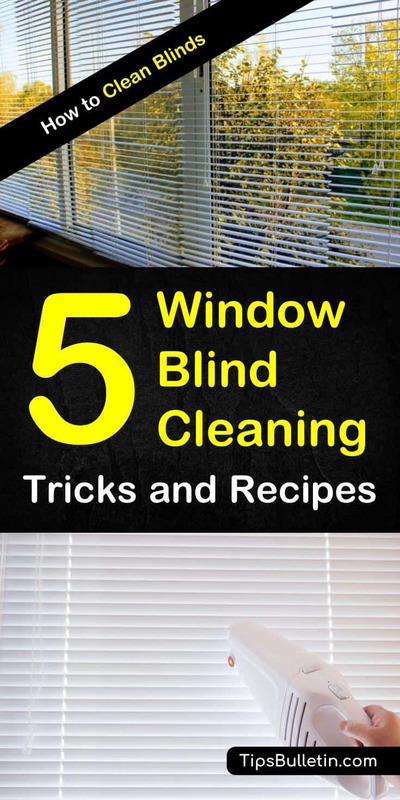 Place the dirty blinds in the tub and scrub both sides of the blind with a sponge, soft brush, or soft mop. After soaking, drain the tub and refill with clean water to rinse the blinds. It is vital that you rinse all the soap suds off to avoid spotting. After rinsing the blinds, lay them on top of a few bath towels to soak up excess water. Finally hang the blinds back up and allow them to dry. To keep your blinds clean, and your hard efforts last, sweep or vacuum the blinds in your home on a regular basis. Taking a proactive approach to cleaning blinds is the best way to keep your window blinds looking great. We hope you enjoyed learning how to clean blinds with these simple tips and techniques. If you found the information in this article useful, please don’t hesitate to share it with all your friends and family.